High-strength steel for high-strength dependability. 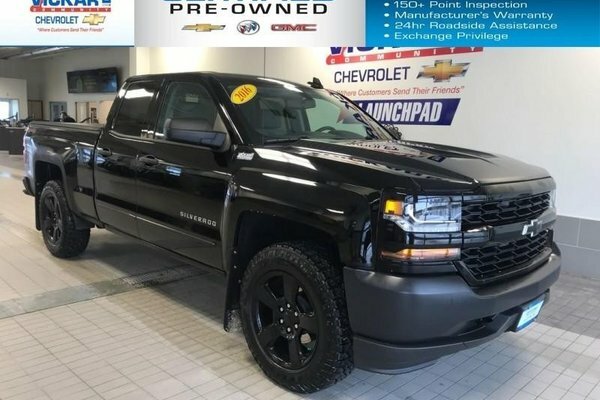 This 2016 Chevrolet Silverado 1500 is for sale today in Winnipeg. The 2016 Chevrolet Silverado 1500 pairs brains with brawn to build upon the legacy of the most dependable, longest-lasting full-size pickup trucks on the road. A muscular front end, sculpted hood and signature LED lighting accents give Silverado a bold new look, while high-strength steel delivers rugged capability that you can depend on day in and day out.This low mileage Double Cab 4X4 pickup has just 9945 kms. It's black in colour. It has an automatic transmission and is powered by a 5.3L V8 16V GDI OHV engine. It has some remaining factory warranty for added peace of mind. Buy this vehicle now for the lowest bi-weekly payment of $259.85 with $0 down for 72 months @ 6.24% APR O.A.C. ( Plus applicable taxes - ). See dealer for details.